The SeaTalk(R) <-> NMEA Bridge is a stand alone single chip computer, that translates information between SeaTalk and NMEA. It can read & write NMEA and read & write SeaTalk data. It translates SeaTalk data into NMEA data, so that you have depth, wind speed and direction, water temerature, position, rudder angel, speed etc. available on your board pc. It translates NMEA data into SeaTalk, so that you can, for example, control the autopilot from the navigation software on the board pc. The seatalk bridge comes with housing. With the latest software version, the bridge also calculates true wind heading and speed from either speed over ground or speed through water. Comes with printed manual and CD. For developers, all source codes, compiler,boot loader software are available upon request. 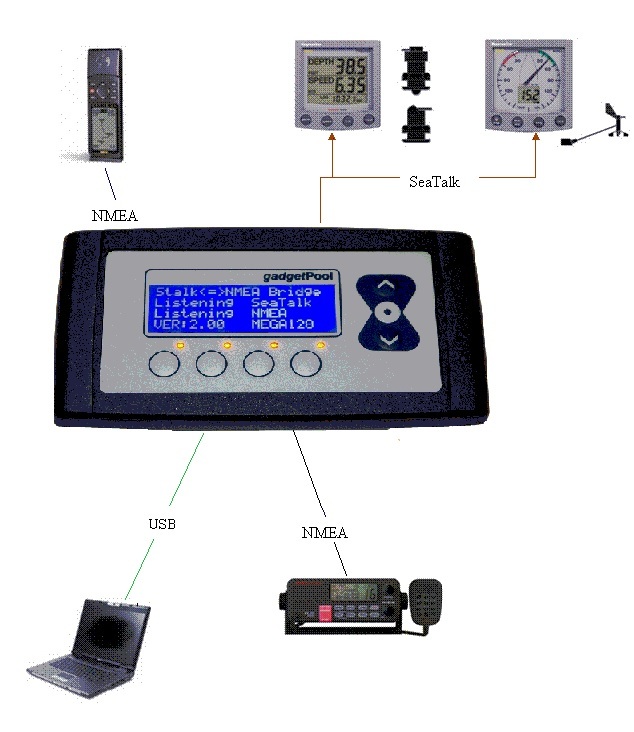 Baudrates for USB port and NMEA ports can be adjusted seperately from 300 to 38400 Baud. Here is a simple example on what you can do with the SeaTalk NMEA Bridge. Have data from SeaTalk devices and from NMEA device combined on your board computer. If you have a Raymarine St60 Tridata, a ST40 Wind Instrument or other SeaTalk devices, the SeaTalk NMEA Bridge will translate information from SeaTalk to NMEA. With this function a navigation notebook or a chartplotter can now display wind direction, wind speed, water depth, speed through water and much more. A ST60 Tridata can display Speed over Ground (SOG). The SeaTalk Nmea Bridge gets SOG from your GPS and sends it to the St60. The speed through water (STW) function of a ST60 tridata needs to be adjusted. The paddle wheels are different, waterflow arround different types of boat hulls are different - therfore your log need propper adjustent in order to display a correct STW. The bridge comes with a printed manual and USB drivers. For developers, all source codes of the bridge software, compilers for the Atmel processor used on the bridge, and bootloader software is available. The user allways must to use charts and other conventional navigation aids.